The second set of stories I wrote, all here on the one page. Featuring the three short stories, the anthology, and the paperback edition of all four. Penelope Black has lost her parents and is being unceremoniously dumped into the cold, grey and forbidding old Kingsmere Orphanage. As if losing her parents wasn’t bad enough, she now has school lessons for eight hours a day, lives with five other girls in the one room, shares a bathroom with twenty-five more, and the one thing that worries her most is living with boys across the hallway. But those things are the least of Penny’s problems. For the school, run by the mysterious Dr Livè and his henchman Grosvenor, has had ten children mysteriously disappear and then reappear, except for two who never came back, all by the time she even arrives. And they all look like they’ve been drugged out of their minds, ending up sicker than when they first vanished into the nurse’s room. There are secrets and lies and mysterious times at Kingsmere Orphanage and Penny’s new friends Alex, Alistair, Alfred and Adrian are determined to find out what’s going on. Even if it means they’re next on the hit list of Dr Livè’s suspected illegal drug trials. Except what they find out is happening is far more deadly than they could have ever imagined. We all know the story of Hansel and Gretel, right? 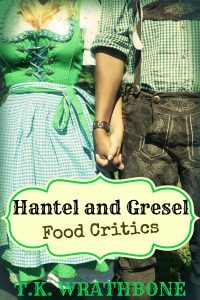 But do you know the story about Hantel and Gresel? Once upon a time in some weird German black forest cake land lived twins called Hantel and Gresel. They were poor, starving children, but after being sent into the forest for food by their mother they were starving no more, for they had found the motherlode of all food. But surely she didn’t mind sharing with two starving children…? Needless to say, she soon put Hantel and Gresel to work to support their newly acquired sugar addiction and that’s how they became the world famous food critics they are today. MIRROR, MIRROR ON THE WALL, WHO’S THE DEADEST OF THEM ALL? Getting inside the old Dolby house on Fourteenth Street has been a prize for teenagers everywhere. So Dallas Howard and his mates, Jett, Louis, Marchone and Zayne find the courage to explore the old Dolby house by night, determined to see for themselves if the house is as haunted as others say it is. They think it’s all a load of hooey and find nothing in the house until they discover an old mirror in a hidden sub-basement. Dallas thinks it’s awesome, the others think it’s creepy, and Dallas takes photos of it to study later. Yet those photos hold a secret to a long forgotten horror that happened centuries ago in the old Dolby house; a secret so horrific that Zayne is affected by it and hospitalised. Can the others find out what’s going on and discover the secrets held by the mirror and deal with the devil once and for all? Due to the nature of this book it is only appropriate for teens 15 years plus. The House: There hadn’t been a house at the end of the street for decades, but suddenly, within days, there’s a house there, at the end of Damo’s street. Lot 666. How did it come to be built so fast? Who could have possibly done it? Or what…could have done it? And why did all those weird things happen when you went inside? Sister Madly: Jessica Blakefield was a normal kid doing normal things when the dreams began. Dreams of someone calling her name…dreams of someone telling her to do things… But who was it making Jessica do the things she did and what did they want with her to the point of putting her in the hospital? And who is this person called Elizabeth? 23: Mel and Andrew Bates are two normal kids on holiday with their parents. They’re at a seaside hotel with a little old lady at the front desk and a weird big brute of a guy as the porter. When weird things go more than bump in the night they need to find their way back to the here and now, and not every other decade their room is sending them too. Room 23 is not normal, and they plan on finding out why. He Who Opens This Book: There’s a weird house on Fourteenth Street that everyone says is haunted. But Mickey thinks it’s a load of rubbish, until his teacher takes his entire school class there as a lesson. The house is completely empty, except for a centuries old book that Mickey mysteriously trips over in the basement. What is the book about and why is it so hard to open? Mickey doesn’t know but he plans on finding out, the only problem is…the book wants him to. TWO BONE: Anthology 2 is the paperback version of the above four e-books. It is the only time you will get them in paperback…at this stage.